Comparative Negligence in Wisconsin Motorcycle Crashes | Hupy and Abraham, S.C. 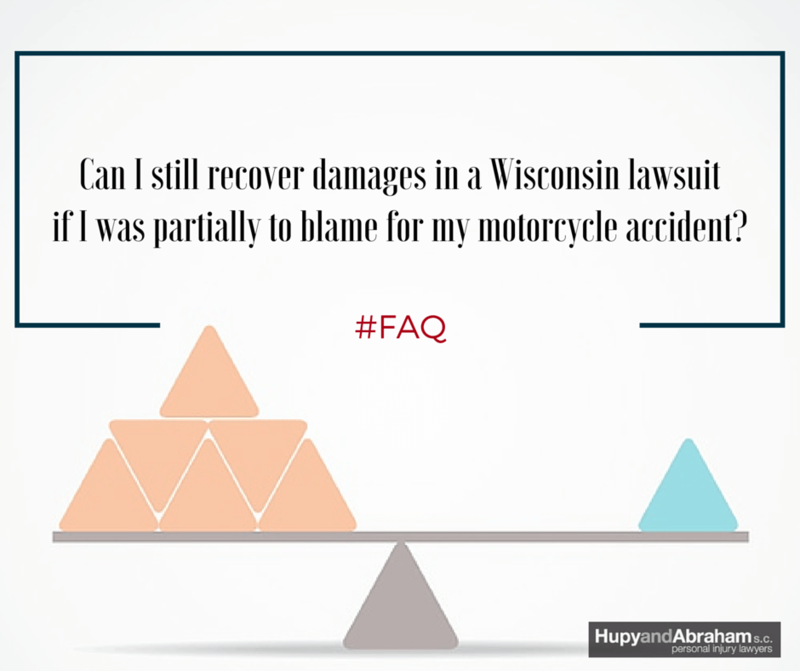 Yes, you may be able to recover damages if you injured in a Wisconsin motorcycle accident and you were partially to blame for the crash. This legal concept is known as comparative negligence. In order to understand comparative negligence, the term “negligence” itself should be defined. In simplified terms, a negligent person is one who has failed to exercise reasonable and proper care for the results of his or her behavior. As a result of this negligence, a motorcycle accident may occur and a motorcyclist may be injured. The person who negligently causes an accident is said to be “liable,” or legally responsible, for the costs and injuries that follow from the negligent behavior. Much of our civil justice system is devoted to determining exactly who is responsible for various incidents. Depending on the nature of the case, a judge or jury may be asked to make that determination. But What If More Than One Person Is Negligent? Things get a little more complicated when more than one person made errors that caused the accident to happen. When more than one person is found to be negligent, each one may find himself liable to pay a portion of the damages. The exact percentage will be guided by state laws and the determination of the judge or jury. In some states, if you are even slightly at fault in an accident, you cannot recover anything at all—a principle called pure contributory negligence. Because that rule often leads to harsh results, most states now follow a comparative negligence rule, under which the jury or judge determines how much fault to assign each person responsible for the accident. Wisconsin follows a system called the “modified comparative negligence, 51 percent rule.” That means that a person may potentially recover damages as long as his share of the fault for the accident was 50 percent or less. The amount of his recovery would be reduced by the extent of his own fault. For example, if jury determined that the victim of a Wisconsin motorcycle accident suffered $10,000 worth of harm, but that she was 40 percent responsible for the collision, she could only collect $6,000 in damages—60 percent of the whole value claim. However, if the rider had been 51% responsible for the crash, then she would not be able to recover any damages. Comparative negligence can be a hotly contested issue after a motorcycle crash. Do not accept the word of the insurance adjuster when it comes to who caused the crash and how damages should be distributed. Instead, contact an experienced motorcycle accident who is also a rider and who is committed to getting you the fair recovery that you deserve in a motorcycle accident case.